The Vega company is probably best known today for its vintage banjos, but it also made a variety of mandolins (including the famous "cylinder-back" model), and was either the third or fourth major manufacturer to produce an electric one. 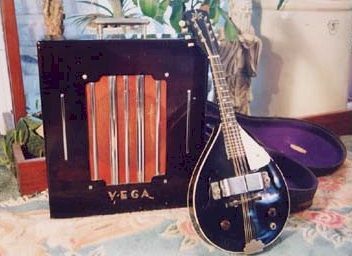 According to renowned guitar collector Scott Chinery, Vega introduced its electric mandolin in 1936, the same year as the Gibson EM150. Vega electrics are quite rare, and the company experimented with different body styles, as well as several types and configurations of pickups, as you can see from the photos here. The most common Vega electrics (based on my coming across a handful of examples of each) seem to be the black model at the top, featuring a Rickenbacker-style horseshoe pickup. Reportedly 100 of these were sold with matching amps. Above right is a Vega D100. All five examples I know about have the same white pickup and chickenhead knobs, which suggests that they are in fact original hardware. The three below are unique, at least in my experience. The one with no soundholes on the right was represented to me as a 1955 Vega, but like Montresor I have my doubts. See Scott Chinery's book The Chinery Collection for yet another photo.